A secret meeting in deep space between two rival powers has been discovered by a third. Not wanting them to come to any kind of agreement, the third party plans to sabotage the conference and wipe out the attendees. This should cause enough animosity between the two that any kind of accord will be impossible for years to come. · Two players are the defenders. · One player is the attacker. · Each chooses a fleet up to the agreed points value (for three players, recommend patrol fleets). 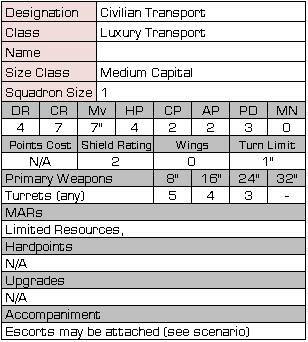 · The defenders each have a civilian ship (stats given below) that holds their conference attendees, at no additional points cost. If desired, the player may detach escorts from one of their capital ships to the civilian ship (choose at the start, the escorts stay with their new ‘parent’). · Each of the defenders chooses a corner of the battlefield. That is their ‘home corner’ to which they must retreat. Their ‘edge’ extends 12” from the corner on either side. 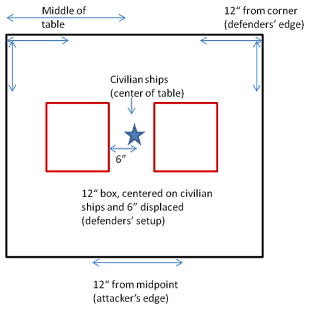 · The attacker uses the middle of the opposite side as their table edge, and may enter over a 24” span. · The defenders’ civilian ships must be set up in the center of the board as shown. The defenders’ fleets are set up in a 12” box, one side centered on the civilian ships but displaced 6” away from the center. They may only leave up to 25% of their fleets in reserves, if desired. · The two civilian ships are in base contact, to facilitate their short range shuttles, however may face any direction. · The attacker enters the table as per the reserves rule, however the attacker begins rolling for reserves on Turn 1. 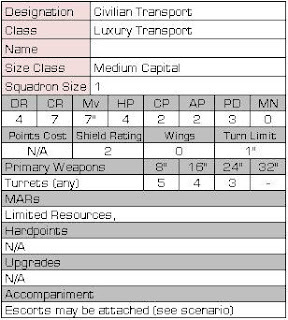 · Scale the battlespace proportionally for larger or smaller tables. · Before anyone rolls for initiative, the attacker makes one attack on each civilian ship from the other one. (i.e. make a 4 dice attack on each civilian ship), to represent their sabotage taking place. · The defenders may not fire at either transport in turn 1 as they do not wish to risk hitting their own ship. · Roll for initiative for each player, play for that turn proceeds as normal. If two players tie for initiative, roll-off for that initiative choice. · The civilian ships act as a squadron on their own. · No ships may shunt in or out of the battlefield. The location was chosen to prevent such surprise attacks. 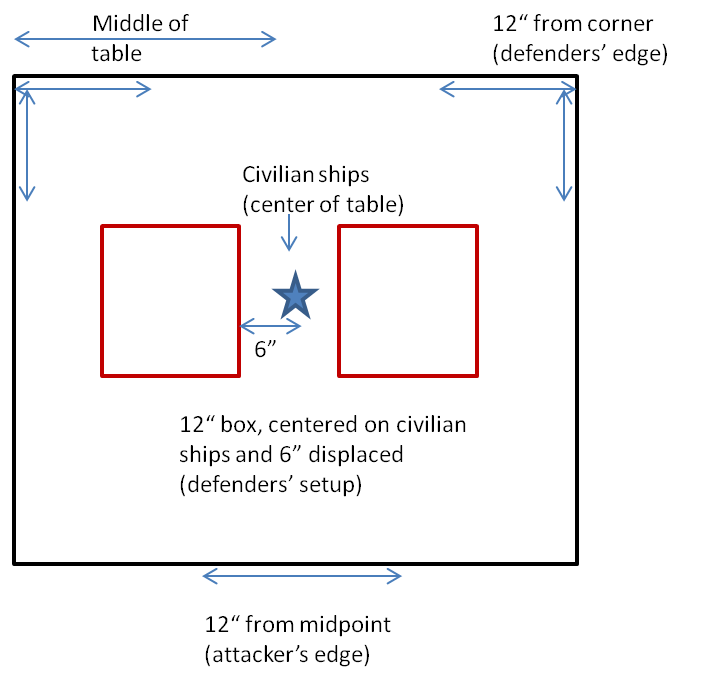 Vessels must either leave the play field (count as destroyed), or depart their player’s table edge (do not count as destroyed). · Ships of either side may start the game halted (no minimum move, but will need to start moving to turn). · Each player scores victory points as normal for destroying enemy vessels as well as losing their own. Maintain battle tracks as normal, paying attention to which player destroys which vessel. · At the end of the game, the winner is the one with the highest battle log. The game is played until both transports are destroyed or removed from play. We played with Terrans (me) as the attackers, Directorate (daughter) and Sorylians (stepson) as the defenders. Initial surges by the Directorate and Sorylians led to some serious damage, while the initial Terran advance was obliterated the turn they arrived (just a squadron of frigates). Later Terran arrivals were able to put paid to the transport ships after doing some serious damage to the other two fleets. A fun game and having the scenario made it more interesting, as there was a clear goal to seek in the battle. The only sad part was we didn't get any pictures. I was more interested in crushing Directorate and Sorylian forces. I recommend trying it out, if you play Firestorm Armada (and why aren't you?). Let me know what you think of the scenario in comments. Thanks James, glad you like it. The defenders would enter from their board edge, the 12" corner that they have to get the transport to.